In July we pruned a couple of the stone fruits to improve their shape. Most notably we removed the central leader of the Damson - which extended a good 3 metres upwards (and was actually providing fruit that no-one could reach). At the end of the orchard's dormant season we prunded some of the apples - the Core Blimey (tree 4), the Tydeman Late Orange (tree 6), and the Greensleeves (tree 8) - all to improve their shape. Apple trees are ideally pruned to a wine glass shape to encouraging fruiting in an open space in the middle of the tree. As in previous years, we have weeded the trees (they don't like the competition for nutrients and water) and mulched them. We are optimistic that we will see some fruit in this, our 5th growing season. We gave the apples and pears a light going over with the pruning shears - and a gentle session with a small saw - and got them ready for the new growing season. Just at the start of March one of our members, Louise, brought in and planted a Cherry (Prunus Stella) in the space in the corner previously occupied by our old cherry - so let's hope that we get some fruit in a couple of years. Due to lack of resources we have not caged it so we will have to trust that it doesn't get attacked by dogs or suffer some other awful fate. Finally, all our trees have been weeded and topped off with a nice layer of bark - to suppress weeds and help water retention. This season proved quite wet so the watering team had a fairly easy time of it - although most of the trees are now in their third season and are less in need of weekly water. That being said, our Comice Pear was in its second season and has looked stronger than in its first. We didn't prune the stone fruits this year - I had hoped that Mick Rand might come and help again this year but he didn't have the time. By the time he told me this the moment had passed, since stone fruits need to be pruned when it is warm and dry. This shouldn't be very problematic although the damson has grown impractically high. Fruit-wise we had slightly sad season - both the Greensleeves and Core Blimey fruited quite healthily but it had all disappeared by the end of August. This was possibly the work of squirrels, or vandals, or simple-minded fools - whatever the cause, we are having to learn to be philosophical. One day there will be enough fruit for all. Both pear trees offered us one pear each, but they too disappeared early. That being said, this year the John Downie crab apple fruited well and Orchard Group member Louise Lewis called dibs on the fruit. She presented me with a little taster pot of the Crab Apple Jelly she made and I have to say it was absolutely delicious - the taste of things to come! The most exciting fruit find was undoubtedly the apricot - which put out a glorious singleton in July, but that too fell victim to (most likely) a trophy hunter. Thanks to the diligence of the watering team, all the trees look like they are going to survive this season. We had a few pieces of fruit taken (by squirrels?) - a pear from the Concorde and a couple of Greensleeves apples - and I rescued the remaining apple from the Core Blimey after the squirrels had chomped away one side of it. It was tangy and crisp and delicious and I wish I could have shared it with everyone - maybe next year!! In late August, Mick Rand came in from the Fitzroy Park Orchard to lend his expertise to the matter of stone fruit pruning. 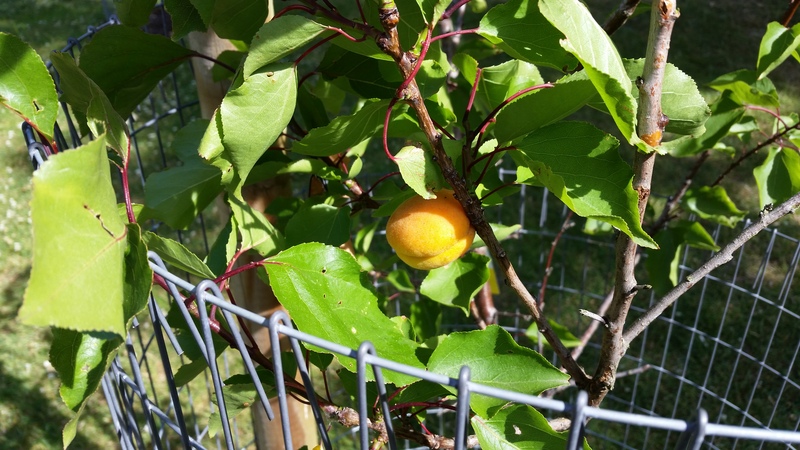 (The stone fruits - the plum, greengage, damson and apricot - have to be pruned in the Summer to avoid getting silverleaf fungal disease from damp winter pruning). In the event we did very little in the way of remedial work and concentrated on reducing or even removing the cages. We felt that there was not a major risk of vandalism, and some of the trees risked being malformed by being restricted. (The cherry is now totally cage-free). The big concern is still damage by over-zealous mowers and strimmers but we are planning to expand the pits (the areas around the trees filled with bark) both to provide a wider safe area and to reduce the competition between the tree roots and the grass roots as the canopies grow). Head Gardener Mark Waters will be lending a hand with this during the dormant Winter season. In mid-March we were offered 4 Cox's Orange Pippins by the Park gardening contractors, OCS. These trees had previously been exhibited by OCS at promotional events and had been sitting in pots for at least a year. Their graft unions had been covered, with the result that they had rooted far too high up the trunk. We trimmed this and hopefully they will be none the worse for it. Also they had grown at a strange angle and so needed to be planted at a compensatory angle to make them straight! But they looked healthy, if unpruned. So bright and early one morning we popped them in - Assistant Gardener Andy did the spade work with "planning approval" given by Head Gardener Mark. So far they look to have taken well and are busy leafing as we head into April. During the Summer we lost our Red Windsor apple tree. It budded, grew leaves and blossoms and even started fruiting (although we removed the fruit to promote root growth). Sadly it started to wilt and slowly died - despite our best efforts to rally it. This Winter, after consultation with our supporters, we have planted a Comice Pear in its place. We have also pruned the apples and existing pear in readiness for the 2014 growing season. The soft fruit (the plum, gage, apricot and damson) should only be pruned in the Summer due to the risk of Silver Leaf disease if pruned in the Winter.